Most of Hawaii's beaches look inviting and for many people, the word “beach” is equivalent to “fun.” However, swimming in the ocean is unlike swimming in a pool and especially in Hawaii, powerful shorebreaks, high surf, strong currents and rip tides are common. On average, 60 people die each year by drowning in Hawaii, according to the State of Hawaii Department of Health Injury Prevention and Control Program. The ocean may look calm, but currents, unlike high surf, are difficult to spot. So be cautious when entering the ocean and read and obey all warning signs. They could save your life. It is best to swim at guarded beaches. But keep in mind that lifeguards are humans too and they can't watch everyone all the time. Stay within sight and near the shore. 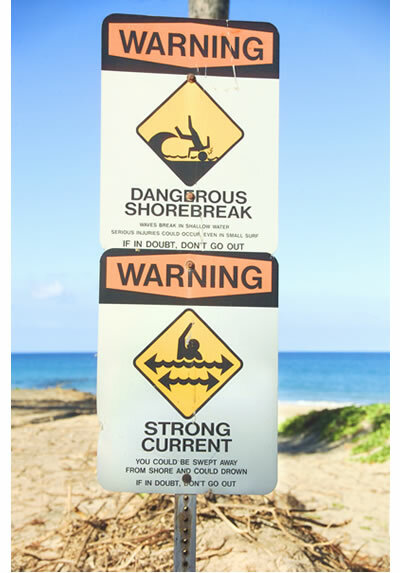 Whenever possible, signs are posted on beaches that warn beachgoers about current dangers, such as strong currents, stinging jellyfish, sharp corals, slippery rocks and other hazards. If you want to swim at a remote beach and notice that no one else is in the water, stay out. There is probably a reason why. Sudden large waves can sneak up on you and sweep you off the beach or rocks and pull you out to deep water without warning. Beach Safety Tip #5: If in doubt, don't go out! Whenever you're not sure if a beach is safe to swim at, don't enter the ocean. Most Rip currents are strong, channeled and fast-moving currents of water flowing away from shore. They usually extend from the shoreline and end past the area where the surf breaks. Rip currents can be very dangerous if one gets caught in one and doesn't know what to do. 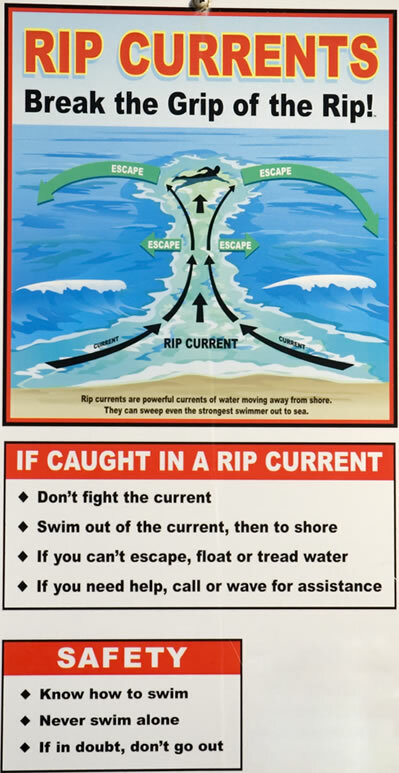 These currents account for many drownings because swimmers caught in a rip get swept out to sea and are unable to return to shore. Swim at a beach that has lifeguards – don't swim at remote or unguarded beaches. Obey all beach warning signs. Ask a lifeguard about the current conditions before entering the water. Stay at least 100 feet (30 m) away from jetties and piers. Rip currents often exist alongside these structures. Watch for turbulences on the water's surface before going into the ocean. Don't fight the current. Don't swim against it. Swim parallel to the shoreline and out of the current. When out of the current, swim at an angle towards shore. If you are unable to escape, stay calm, tread water or float. Call or wave for help. If a lifeguard is not present, call 911. If possible, throw the rip current victim something that floats – an inflatable water toy or lifejacket, etc. Final Tip: The individual beach conditions on all Hawaiian islands are seasonal, meaning that in some months a particular beach can be great for ocean activities, such as swimming, snorkeling, surfing, etc. but in other months these activities may not be possible or may even be hazardous. Always check with the lifeguards before going in the water and use common sense. And remember: "If in doubt, don't go out."